The guy who is way too into spelling in me is going nuts right now. On a short trip away from my desk yesterday to seek out some throat lozenges and lunch, I came across something I’d never seen before: Cadbury Screme Eggs. I’ve been mostly out of the candy scene for a few years now, only occasionally browsing dollar store candy aisles in hopes of finding something that has some sort of ridiculous quality to it. Barring the Star Wars Mega Egg -which I’d file under “Star Wars” or “Disappointing Garbage” before “candy”- it’s been over three years since my last candy article. And another three years to the one before that. I need to get out of my video game writing rut. Hey, maybe three years from now I’ll rustle up the will to write another one. Of course, since I’m very professional, I made sure to do a little research before starting this write-up. And from reading the date stamps on my Google search results, I’ve been led to believe that these Screme Eggs debuted at Halloweentime of last year. I feel like I did do a little ‘Ween candy-watching last year any time I visited Wal-Mart, but never saw these little guys. Perhaps they hadn’t made their way to Canada yet? Maybe Wal-Mart has a ban on selling chocolate eggs that look like they’re wrapped in dirty bandages? On that note, the Screme Egg demands your attention in the aisle. The big green splatter on the facing and the box full of mummy bandaged and exposed brain’d eggs are hard to miss. I really doubt that I could have ever been in the same store from these things and not noticed them. Just look at that brain wrapper. Is that not the best candy wrapper you’ve ever seen? I’ll admit that yeah, there’s been brain wrappers before, but the brain and the green splat and the purple base really work together. The mummy wrapper is cool too, but doesn’t pop quite the way the brain design does. Now that I think about it, it almost looks like some sort of macabre Barney Egg. Cool. 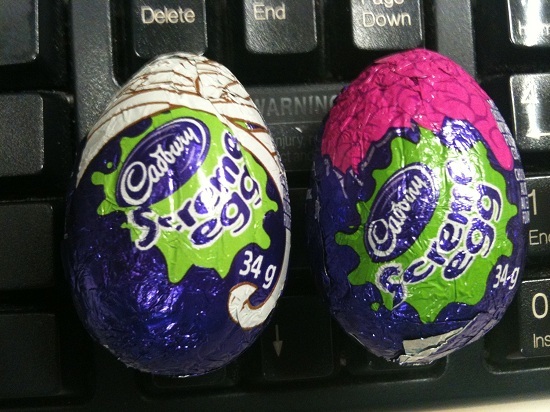 In some kind of strange promotional candy twist the Screme Egg looks… exactly the same? Hey! What’s the big idea, Cadbury? I was expecting something Halloweeny. Something unlike the usual egg, at any rate. You have no idea haw difficult it was to get that shot. As is the usual way these days, I took the pictures with my phone. The problem being that the iPhone has a thing about light. You’ll notice that pictures taken in my house are generally a little yellow or washed out. Since I took the pictures at my desk at work, I had a decent light source, but my phone decided that it was going to pump up the light reflecting off the foil, and it seemed like I was going to have to choose between a dark shadowy shot or one that looked like a solar flare taking a huge dump. In hindsight, I don’t think that joke was worth the buildup. Clearly I was able to get off a nice shot though. And yes, I’m aware that the solutions would have been to remove the foil wrapper. I’m not an idiot. Woah woah woah! Now that is more like it! The disgusting greenish glop in the middle is advertised right on the boxes and bags of mini Scremes, but I wanted to build up and then surprise anyone who might not have seen them yet. The green ooze filling is a little disappointing in that the whole thing isn’t green, but if the packaging is to be believed they were just interested in changing the yolk. Too bad, though it certainly doesn’t lessen the product. A chocolate egg with delicious sugary filling is all well and good, but a chocolate egg with radioactive green goop inside is the kind of thing that changes lives. 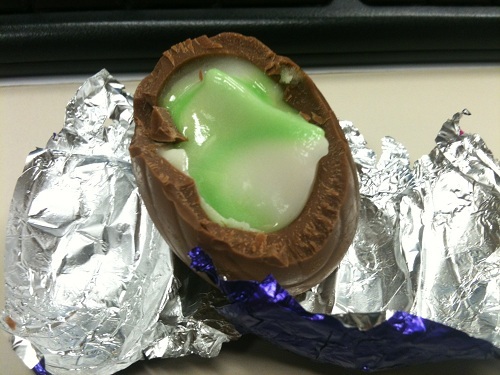 Screme Eggs, despite their oh-so appealing green innards, taste exactly like the run-of-the-mill Creme Egg. I won’t take issue with that, because I didn’t expect it to taste any different, but I feel that Cadbury really missed the boat there. If you bite into it without looking at it, it’s business as usual, but look at that swirly green and white goop. Does that not look like it should be peppermint flavoured? I couldn’t help but think I was going to get a blast of cool peppermint when I bit into it, but alas. 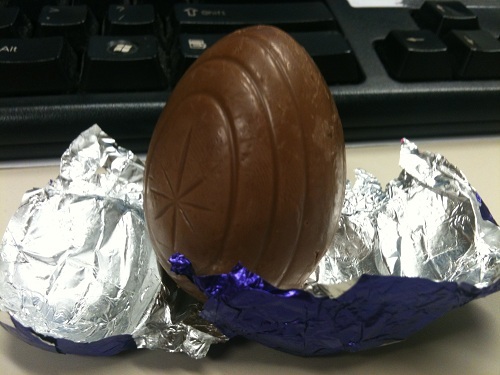 More research shows that at one time there was a peppermint egg, but it was a New Zealand exclusive and discontinued in 2010. Darn. It also seems that the Screme Egg is the first Halloween-themed Creme Egg variant, which I find incredibly strange for a candy that’s been around since the early Sixties. Oh well. I thought maybe I’d stop caring if I typed it enough times, but I’m still a little perturbed by the spelling of Screme Egg. I know it’s a pun, but gah. I suppose S’creme wouldn’t have worked as well, and simply calling it a Scream Egg would have negated any punnery. It’s really a lose-lose situation for me. I suppose I’ll just have to get used to seeing the “word” Screme for the next few months. Not the worst, but it’s one of those little things that get under my skin. Well, try as I might, I was not able to break the 1000 word barrier on this one. But I defy anyone to write more than that about any variant of Cadbury Creme Eggs. It’s not a thing that humans were meant to do. And I really don’t want to spend my last paragraph musing about my word count again, so here’s a Creme Egg anecdote.